Through the holiday season, Gatlinburg visitors can meet characters and storytellers and enjoy caroling along the Parkway in downtown Gatlinburg, TN every Friday and Saturday evening. 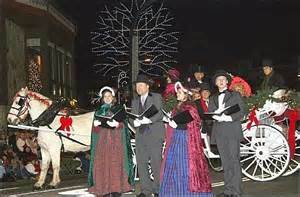 Dickens-style holiday carolers dressed in traditional Victorian era costumes stroll along the Parkway in downtown Gatlinburg from 5:00 pm to 9:00 pm. Most performers will do a brief opening show together at 5:00 pm in The Village and then another opener at 5:30 in Baskins Square. Most performers will have scheduled staging areas for 15 minute shows on the hour and half hour on a rotation basis. We will have a closing performance at 8:45 pm each night as Reagan Terrace Mall – the “Yule Log Finale”. As you know the old ‘Hoedowns’, now known as the “Smoky Mountain Shindig”, are always a popular performance!